Intermec EasyCoder PF8 Series printers, available in direct thermal (PF8d) or thermal transfer (PF8t) versions, offer compact size, sturdiness, and silent operation, perfect for a variety of applications in retail, office, service industry and health care settings. The inexperienced or busy user will appreciate Intermec's Connect to Print concept, a standard feature on both the PF8d and PF8t, which makes setting up and printing a quick and easy task. Connect to Print means that the PF8 is all inclusive of software, drivers, cables, and sample labels, for one low price. Thermal transfer, 300 dpi, RS-232 serial, Parallel and USB interfaces. Power cord (Part# 226-000001-200) not included. See accessories. Thermal transfer, 203 dpi, RS-232 serial, Parallel and USB interfaces. Power cord (Part# 226-000001-200) not included. See accessories. Direct thermal only, 203 dpi, RS-232 serial, Parallel and USB interfaces. Power cord (Part# 226-000001-200) not included. See accessories. 2" x 4" Direct thermal paper label. 32 roll case. 4.1" x 900' Black Wax Ribbon. Compatible with Desktop Printers. 6 ribbon case. 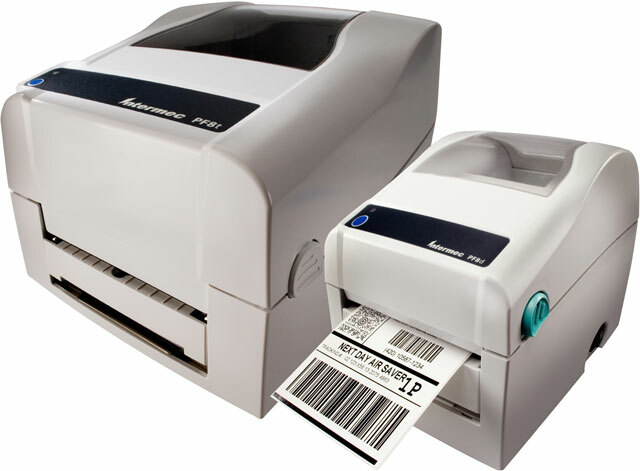 Used with paper labels.